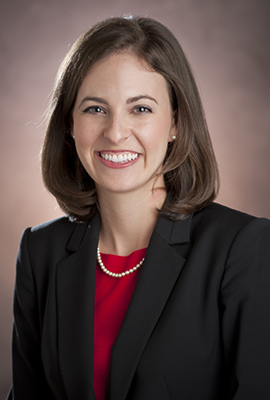 Kristin Strunk Lowry joined Georgia Law as an assistant director of career services in July of 2012 and became an associate director in April 2013. Her job duties include general career counseling, employer outreach and managing off-campus interview programs. Previously, Lowry practiced for nearly four years as an associate at Hatcher, Stubbs, Land, Hollis, & Rothschild in Columbus, Ga., handling litigation matters, principally in the area of medical malpractice defense. She also clerked for Judge H. Patrick Haggard of the Georgia Superior Court for the Western Judicial Circuit. Lowry earned her undergraduate degree in international business with highest honors from Auburn University in 2004 and her law degree from UGA in 2007.